A defiant defensive performance earned Scarlets a Guinness Pro14 victory over Munster in terrible conditions at Parc y Scarlets. Ioan Nicholas' first half try was the difference in a 10-6 victory, with Leigh Halfpenny adding a penalty and conversion. 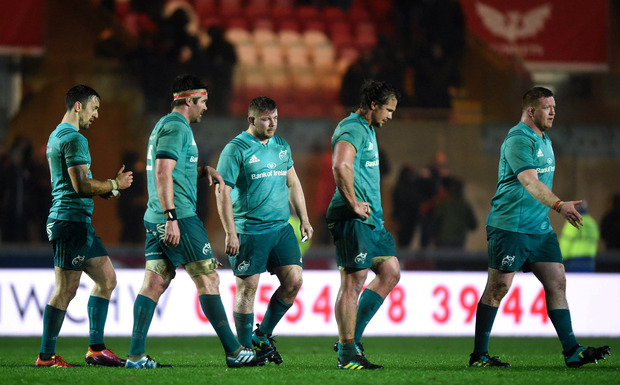 Munster, who had to settle for a losing bonus point, could only muster two Bill Johnston penalties, despite having the lion's share of territory and possession. The defeat sees Johann van Graan's side drop to second place in Conference A, with Glasgow Warriors now on top. Centre Kieron Fonotia led Scarlets for the first time as Wayne Pivac made one change to the side that claimed a bonus-point win over the Cheetahs, with Lewis Rawlins coming into the second row as Jake Ball was retained by Wales. Ryan returning from Ireland duty to start at tighthead prop. Rory Scannell returned to make his 100th Munster appearance. Scarlets had little possession in the opening 40 minutes, but they did score a fine try when wing Nicholas went over from Jonny McNicholl's neat pass out of the back door. The introduction of Tyler Bleyendaal at fly-half for Munster saw a change of tactics as he kicked for the corner, but Halfpenny beat Sweetnam to the ball. Scarlets' line-out did not function perfectly and that put them under pressure in the closing stages, but they managed to hold on in a heroic rear-guard performance.